IBM branded (non-generic) 1TB 7.2K SATA HDD for your IBM Systems Storage need. The IBM FRU 44X2458 is a 1TB 7,200 RPM SATA hot-swap hard drive for use specifically with IBM System Storage. Whether you’re upgrading your IBM enterprise storage or simply looking for a replacement hard drive, we have what you need. If you don’t see the part listed that you’re looking for, please use our Contact Us form; as we have many parts in inventory that are not listed. Please note that all IBM hard drives, systems and parts are used / refurbished, fully-tested, and backed by a 60 day warranty. Same day, expedited, and international shipping are available! The IBM4618 44X2458 44X2459 SATA Drive is a 3Gb/sec drive with an interface speed of 7,200 rpm and 1TB of raw capacity, used to add additional SAN storage capacity to your existing IBM DS4000 series enterprise storage array, or other compatible device. It is designed to increase physical storage capacity and flexibility of compatible models. 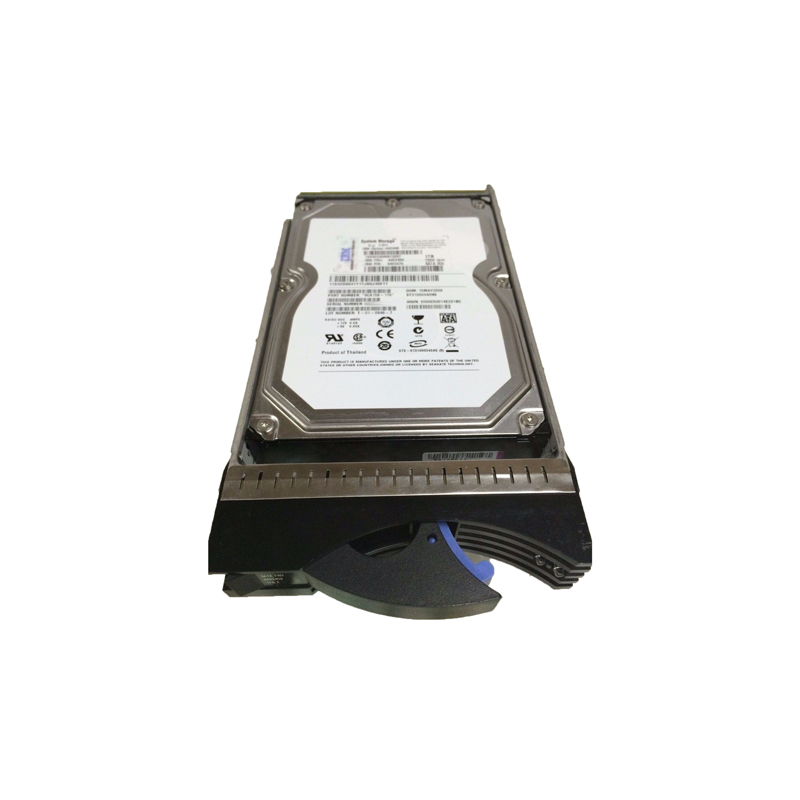 The 1000 GB/7200 rpm SATA II Enhanced Disk Drive Module (E-DDM) feature (#4618/part number, SEO 44X2458) is designed to increase the physical storage capacity of the DS4700 Express Models and DS4000 EXP810 Storage Expansion Unit up to 16 terabytes (TB) per enclosure. DS4700 configurations that scale up to 112 TB physical storage capacity can be built by using 1000 GB SATA E-DDMs to populate the drive bays of the DS4700 and the drive bays of the attached EXP810 Expansion Units. IBM SATA / Serial ATA Hard Drives are used to provide extremely large storage capacities in servers that use hot swappable (hot-swap) drives with a SAS / SATA hot pluggable backplane. Using a hard drive tray or caddy or sled, hard drives are replaced by simply sliding and clipping the drive into the front of the Systems Storage server. IBM SATA hard drives can also be used in an internal, non hot-swap application, in which they are connected by a cable to a connector on the SAS / SATA controller.